RoguePlay is very pleased to offer this unique opportunity in the Midlands to students who are keen to take their aerial training to a higher level and focus on becoming professional performers. This four week professional course aims to support students who are committed to developing a career in the aerial arts, and becoming an elite performer with the knowledge and skill to sell their acts and perform across the globe. ​ ​ ​ VIEW THE 2019 TIMETABLE NEXT COURSES: APRIL 1st-25th 2019 ​ ​ The course will focus on the following disciplines: rope, silks, straps, hoop, handstands, flexibility, conditioning and Act Creation. During the course you will be able to specialise in one of the aerial skills mentioned. There will be presentation and performance elements enabling the students to leave the course with a structured aerial material and/or act. This material will be filmed as a showreel at the end of the course. Your practical skills development will be underpinned with seminars in anatomy, basic rigging, selling your act and liaising with venues and festivals, enabling you to progress into the professional sector once you leave the course. This 4 week course will also allow you to apply for longer term courses RoguePlay will be running in the future for circus professionals. The course takes place over 4 weeks, 10-4pm Monday-Thursday. Attendance on the course is by way of the online application, through which you are required to submit some video footage of training. We will then contact you to let you know if your application has been successful. On course completion all students will be given a certificate of skill in order to demonstrate their participation in the programme. ​ COURSE ELEMENTS Aerial technique & conditioning in a range of apparatus Increasing your aerial vocabulary focusing on drops, balance, suspension and static elements Flexibility and range of movement Anatomy and injury prevention Understanding momentum, rotation and power Aerial creation and performance work Technical presentation and performance elements Feedback and mentoring sessions Open training and practice time Seminar based sessions in understanding how to price yourself and the process of selling your act and programmer liaison SKILLS TAUGHT INCLUDE: Rope, Silks, Straps, Hoop, Handstands, Flexibility, Conditioning and Act Creation. TEACHERS: Silk & Rope: Kim Charnock and one other (TBC) Straps, Handstands, Conditioning & Flexibility: TBC Hoop & Act Creation: Aisling Ni Cheallaigh Act Creation & Seminar sessions: Kim Charnock Anatomy & Partner Massage: Adrian Thomas ​​ Aisling Ni Cheallaigh Aisling ní Cheallaigh is an Irish aerialist homegrown and hand reared by a conglomerate of companies and coaches including Fidget Feet Aerial Dance, Ether Productions and Taking Flight. She delights in flight and movement and while she specialises in aerial hoop she is also an expert dabbler in Rope, Fabric and Doubles Trapeze. She has recently started the serIous discipline of being hit in the face repeatedly by a Cyr. She has traveled far and wide performing with various companies and has so far landed in Australia, The US, Canada, Asia and Europe. She is free range, organic and corn fed. 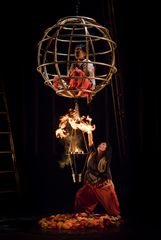 www.aislingcircusarts.com ​ Kim Charnock Kim is the artistic director of RoguePlay Theatre, a renowned aerial theatre company based in Birmingham, UK. 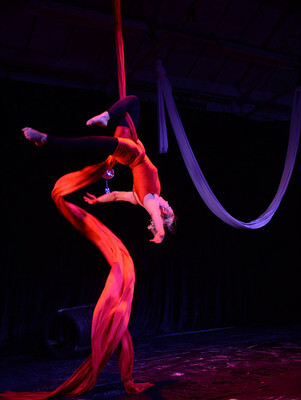 With 9 years experience in aerial and circus direction, Kim is known for her strong dynamic technique on verticals, and her fluid originality on the most romantic of the aerial arts; silk. Kim has a passion for the creation of innovative new work, particularly experimenting with the combination of aerial movement and text having directed nationally and internationally touring shows and worked across the UK with companies such as Channel 4, Nofit State, Xbox and Panasonic. ​ Adrian Thomas Adrian is a level 5 qualified remedial therapist specialising in working with circus artists. He graduated from the Active School of Complementary Therapy (ASCT) in 2013 gaining a BTEC Level 5 Diploma in clinical sports and remedial massage. This is currently the highest qualification that can be held in the UK, recognised nationally and in many other countries. ​ AGE: There is no upper age limit, but a lower limit of 16 years. DATES & TIMES: April 1st-25th Nov 4th-28th 10-4pm Monday-Thursday PLACES 10 places are available on this course COST: £800 total in two instalments £400 when reserving your place. This is to be paid upfront. (Please refer to our cancellation policy) £400 no later than 30 days before course starts APPLICATION Please apply online via our Google Forms HERE DEADLINE FOR APPLICATIONS IS MIDNIGHT MARCH 24th & MIDNIGHT OCT 27th RESPECTIVELY ​ FAQs: How do I apply for the course? Attendance on the course is by way of the online application, through which you are required to submit some video footage of training. We will then contact you to let you know if your application has been successful. There is no fixed format or content for video, but any extra evidence of skills and experience will be taken into account when considering applications. It does not have to be professional quality footage, or professional level performance. Footage or photos can be from performances at school / college, local festivals, practise sessions etc. We understand that not everyone will have videos or photos but please provide details of all performances and performable skills in your CV. Criteria assessed in your application: Current level of training and suitability on the course. You must be able to demonstrate existing some aerial skill with the ability to confidential climb/ascend the apparatus, invert repeatedly and with ease, and demonstrate a number of different tricks. Existing flexibility will be an advantage. Is accommodation provided? RoguePlay does not have its own accommodation for students, however there are a number of budget accommodation options available close to the training space. We are also happy to request spare rooms from current students, who will often be keen to help. Once you are accepted onto the course RoguePlay will try to help with any accommodation problems. Cancellations: Due to the popular nature of this course, first instalment payments are non-refundable. Second instalment payments are required no less than 30 days prior to the course start. Once the full fee has been paid it becomes non-refundable. Should the second instalment payment not be made 30 days or more before commencement, the place may be forfeited and offered to another candidate. No first instalment refund will be available in this circumstance. Should you become unable to attend, you are allowed to sell your place by posting your spot on our social media channels, although we will need to make sure first that the person who takes your place is suitable for joining the program. To avoid difficulties, please ensure you are 100% committed before deciding to take the spot. Do you cater for disabilities? Yes we do. RoguePlay is an inclusive school and we welcome those with disabilities on the majority of our courses. Please tell us as much information as you can in your application to ensure we are able to meet your needs. Please note that the studio space is all on ground level but there is no wheelchair accessible toilet. There is a cafe just 2 minutes walk from the studio space with an accessible toilet onsite.